The provisions of this chapter shall govern permanent inground residential swimming pools. Permanent inground residential swimming pools shall include pools that are partially or entirely above grade. This chapter does not cover pools that are specifically manufactured for above-ground use and that are capable of being disassembled and stored. This chapter covers new construction, modification and repair of inground residential swimming pools. Permanent inground residential pools shall comply with the requirements of Chapter 3. 802.1 Materials of components and accessories. The materials of components and accessories used for permanent inground residential swimming pools shall be suitable for the environment in which they are installed. The materials shall be capable of fulfilling the design, installation and the intended use requirements in the International Residential Code. The structural design and materials shall be in accordance with the International Residential Code. The construction tolerance for dimensions for the overall length, width and depth of the pool shall be ± 3 inches (76 mm). The construction tolerance for all other dimensions shall be ± 2 inches (51 mm), unless otherwise specified by the design engineer. The minimum diving water envelopes shall be in accordance with Table 804.1 and Figure 804.1. Negative construction tolerances shall not be applied to the dimensions of the minimum diving water envelopes given in Table 804.1.
a.The minimum length between points C and D varies based on water depth at point D and the floor slope between points C and D.
b.See Figure 804.1 for location of points. Walls in the shallow area and deep area of the pool shall have a wall-to-floor transition point that is not less than 33 inches (838 mm) below the design waterline. Above the transition point, the walls shall be within 11 degrees (0.19 rad) of vertical. Offset ledges shall be not greater than 8 inches (203 mm) in width. Where an offset ledge is located less than 42 inches (1067 mm) below the design waterline, the width of such ledge shall be proportionately less than 8 inches (203 mm) in width so as to fall within 11 degrees of vertical as measured from the top of the design waterline. Floor slopes shall be in accordance with Sections 807.1.1 through 807.1.3. The slope of the floor from the beginning of the shallow end to the deep area floor slope transition point, indicated in Figure 804.1 as Point E to Point D, shall not exceed 1 unit vertical in 7 units horizontal. 807.1.2 Shallow to deep transition. The shallow to deep area floor slope transition point, indicated in Figure 804.1 as Point D, shall occur at a depth not less than 33 inches (838 mm) below the design waterline and at a point not less than 6 feet (1829 mm) from the beginning of the shallow end, indicated in Figure 804.1 as Point E, except as specified in Section 809.7. The slope of the floor in the deep end, indicated in Figure 804.1 as Point B to Point D, shall not exceed a slope of 1 unit vertical in 3 units horizontal (33-percent slope). 807.2 Shallow end water depths. The design water depth as measured at the shallowest point in the shallow area shall be not less than 33 inches (838 mm) and not greater than 4 feet (1219 mm). Shallow areas designed in accordance with Sections 809.6, 809.7 and 809.8 shall be exempt from the minimum depth requirement. 808.1 Manufactured and fabricated diving equipment. Manufactured and fabricated diving equipment shall be in accordance with this section. Manufactured and fabricated diving equipment and appurtenances shall not be installed on a Type O pool. Manufactured diving equipment shall be designed for swimming pool use. Where manufactured diving equipment is installed, the installation shall be located in the deep area of the pool so as to provide the minimum dimensions as shown in Table 804.1 and shall be installed in accordance with the manufacturer’s instructions. Manufactured diving equipment shall have a permanently affixed label indicating the manufacturer's name and address, the date of manufacture, the minimum diving envelope and the maximum weight limitation. Diving equipment shall have slip-resistant walking surfaces. For the application of Table 804.1, Point A shall be the point from which all dimensions of width, length and depth are established for the minimum diving water envelope. If the tip of the diving board or diving platform is located at a distance of WA or greater from the deep end wall and the water depth at that location is equal to or greater than the water depth requirement at Point A, then the point on the water surface directly below the center of the tip of the diving board or diving platform shall be identified as Point A. 808.7 Location of pool features in a diving pool. Where a pool is designed for use with diving equipment, the location of steps, pool stairs, ladders, underwater benches, special features and other accessory items shall be outside of the minimum diving water envelope as indicated in Figure 322.2. 808.8 Stationary diving platforms and diving rocks. Stationary diving platforms and diving rocks built on-site shall be permitted to be flush with the wall and shall be located in the diving area of the pool. Point A shall be in front of the wall at the platform or diving rock centerline. The forward tip of manufactured or fabricated diving equipment shall be located directly above Point A as defined by Section 808.6. The maximum elevation of a diving board above the design waterline shall be in accordance with the manufacturer’s instructions. Manufactured diving equipment installation and use instructions shall be provided by the diving equipment manufacturer and shall specify the minimum water dimensions required for each diving board and diving stand combination. 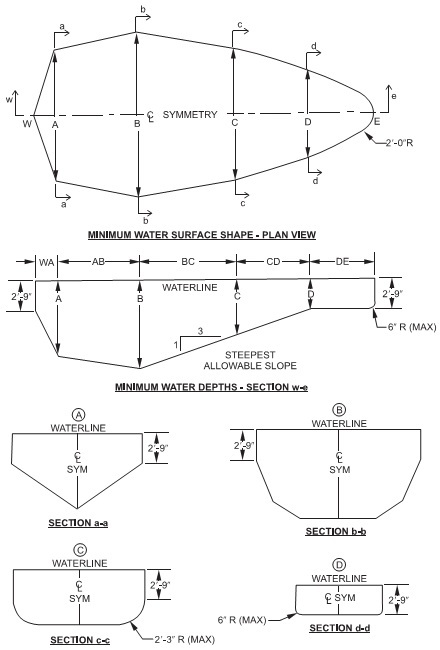 The board manufacturer shall indicate the water envelope type by dimensionally relating their products to Point A on the water envelopes as shown in Figure 804.1 and Table 804.1. The board manufacturer shall specify which boards fit on the design pool geometry types as indicated in Table 804.1. 808.12 Platform height above waterline. The height of a stationary diving platform or a diving rock above the design waterline shall not exceed the dimensions in Table 808.12. 808.13 Headroom above the board. The diving equipment manufacturer shall specify the minimum headroom required above the board tip. Slides shall be installed in accordance with the manufacturer’s instructions. Pools shall have a means of entry and exit in all shallow areas where the design water depth of the shallow area at the shallowest point exceeds 24 inches (610 mm). Entries and exits shall consist of one or a combination of the following: steps, stairs, ladders, treads, ramps, beach entries, underwater seats, benches, swimouts and other approved designs. The means of entry and exit shall be located on the shallow side of the first slope change. 809.3 Secondary entries and exits. Where water depth in the deep area of a pool exceeds 5 feet (1524 mm), a means of entry and exit shall be provided in the deep area of the pool. 809.4 Over 30 feet in width. Pools over 30 feet (9144 mm) in width at the deep area shall have an entry and exit on both sides of the deep area of the pool. The design and construction of stairs into the shallow end and recessed pool stairs shall conform to Sections 809.5.1 through 809.5.3. 809.5.1 Tread dimension and area. Treads shall have a minimum unobstructed horizontal depth of 10 inches (254 mm) and a minimum unobstructed surface area of 240 square inches (0.15 m2). Risers, other than the top and bottom riser, shall have a uniform height of not greater than 12 inches (305 mm). The top riser height shall be any dimension not exceeding 12 inches (305 mm). The bottom riser height shall be any dimension not exceeding 12 inches (305 mm). The top and bottom riser heights shall not be required to be equal to each other or equal to the uniform riser height. Riser heights shall be measured at the horizontal centerline of the stairs. In design water depths exceeding 48 inches (1219 mm), additional steps shall not be required. 809.6 Beach and sloping entries. The slope of beach and sloping entries used as a pool entrance shall not exceed 1 unit vertical in 7 units horizontal (14-percent slope). 809.7 Steps and sloping entries. Where steps and benches are used in conjunction with sloping entries, the vertical riser distance shall not exceed 12 inches (305 mm). For steps used in conjunction with sloping entries, the requirements of Section 809.6 shall apply. Surfaces of architectural features shall not be required to comply with the 1 unit vertical in 7 units horizontal (14-percent slope) slope limitation. The horizontal surface of underwater seats, benches and swimouts shall be not greater than 20 inches (508 mm) below the design waterline. The circulation system equipment shall be sized to provide a turnover of the pool water not less than once every 12 hours. The system shall be designed to provide the required turnover rate based on the manufacturer’s specified maximum flow rate of the filter, with a clean media condition of the filter. Pressure filter systems shall be provided with a strainer located between the pool and the circulation pump. In pools where the point of first slope break occurs, a rope and float assembly shall be installed across the width of the pool. The rope assembly shall be located not less than 1 foot (305 mm) and not greater than 2 feet (610 mm) towards the shallow side of the slope break. Rope anchoring devices shall be permanently attached to the pool wall, coping or deck. Rope ends shall attach to the rope anchor devices so that the rope ends can be disconnected from the rope anchor device.